→Who is responsible when something falls off a commercial truck? Many people in the Chicago area still remember the tragic crash that occurred more than two decades ago while a Chicago family was traveling on highway I-94. Their van hit a piece of metal debris in the roadway that had fallen from a commercial truck. The truck part was a 90-pound, 6-inch in diameter and 18-inch-long bracket. The debris, called a mudflap/taillight assembly, punctured the mini-van's gas tank, and the mini-van burst into flames. The van driver, a Chicago pastor and his wife, were able to extricate themselves from the van, but their efforts to save their six children sadly failed. Five of the children, ranging in age from 6 weeks to 11-years-old died at the scene. A sixth child, aged 13, died early the following morning. Three older siblings were not in the vehicle. Investigation revealed that the driver of the truck had lied to obtain his trucking license and had bribed the state licensing authority. He was unqualified to drive. And, he ignored signals from other drivers that his truck was about to lose the large piece of metal. In 2000, after years of litigation, the insurers for truck and truck part manufacturers, owners and operators, paid a $100 million settlement to the surviving parents and siblings. The accident was so notable that it periodically makes the news with updates on the status of the surviving parents, their three older children and their grandchildren. Such tragedies continue to happen in cities and states across the nation. Not long ago, a California bicyclist was killed when a container fell off of a truck, landed on the bicyclist and crushed him to death. In Minnesota, a truck driver on his way to a construction site failed to properly secure a 50-pound concrete block in the flat-bed truck. The block “dropped” off the back of the truck and flew through the windshield of a van traveling behind the truck. It instantly killed the 17-year-old young man sitting in the van passenger seat. Earlier this year in Texas, a large piece of equipment fell off of a semi-truck and landed in the middle of a busy highway. A driver was killed when he plowed into the large fallen object. 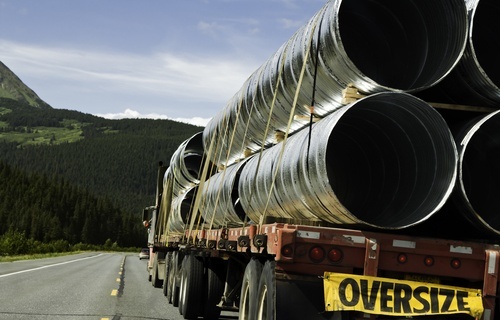 Recognizing the often-catastrophic outcome of unsecured items falling off a commercial truck, federal law has securing requirements depending on the type of cargo that is being carried. The Federal Motor Carrier Safety Administration (FMCSA) regulates the trucking industry. In 2004, it promulgated updated rules requiring the way cargo is to be secured on commercial trucks. The intent of the rules is to reduce accidents caused by shifting cargo or from cargo falling from the truck. The securing requirements vary with the type of cargo. For example, logs must be secured differently than metal coils. Large boulders are secured differently than rolls of paper. The trucking company is responsible for making sure all its employees and drivers know and follow the cargo securing rules. The FMCSA publishes a truck driver’s guide to cargo securement which provides information as to how specific cargo is to be secured. It also requires the driver to carefully inspect the cargo before starting a trip as well as to inspect periodically throughout the trip. When cargo falls off a truck and causes injury or death, the driver, the shipping company and the trucking company can all be responsible for safety violations in failing to properly secure the load. Fortunately, the majority of truckers and their companies are insured. Those injured have the right to collect damages from the company and the driver. Insurance policies typically cover the claims made against truck companies and drivers. If you were injured, or someone you loved was killed - whether due to improperly secured cargo, whether the cargo flew off the truck and hit you, or landed on the road and you rammed into it, you need the assistance of experienced tr​​ucking accident attorneys. Those who lost a loved one due to the negligent securing can pursue wrongful death claims. At the Blumenshine Law Group, we have decades of experience dealing with accidents involving the commercial trucking industry. We know how the legal process must be worked in holding the company and the driver responsible for their negligence in securing their cargo. We are committed to seeing that you receive the maximum compensation to which you are legally entitled. For a free consultation, contact us either online or by calling (312) 766-1000. The law requires you to bring your lawsuit within a certain period after the accident, so do not hesitate. If you are unable to come to us, we can come to you. We can arrange a visit with you in the hospital or meet with you at your home.